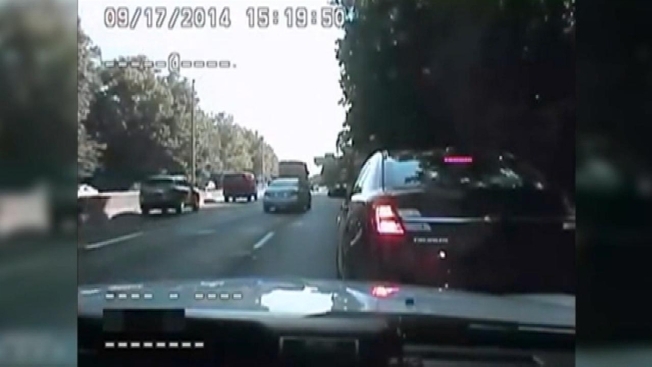 A police officer stationed on a Bronx highway saved a driver who started to slow down when she began choking on a piece of candy, the NYPD says, and the rescue was captured on the officer's dash cam. The officer was conducting speed enforcement on the Bronx River Parkway Wednesday when he saw a 2014 Ford Taurus slow down in the right lane, according to the NYPD. He pulled up behind the car, got out of his vehicle and immediately noticed the driver was in distress, police said. She appeared be having difficulty breathing and was holding her throat. "Are you choking? You're choking?" the officer is heard saying in the video as he motions her out of the car. "Yes, sir," the 49-year-old woman says, gagging. The officer performed the Heimlich maneuver on the woman, which dislodged the throat lozenge blocking her airway, police said. The woman appeared to be OK after the officer performed the Heimlich. He radioed for an ambulance to the scene.